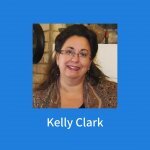 Join us for one day only with Kelly Clark! Kelly will teach covering 8 to 10 techniques! Lunch provided. Advance registration required by May 1. 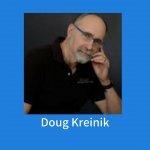 Kreinik Seminar with Doug Kreinik! Come to the Kreinik Seminar to meet and learn from Doug Kreinik, the owner of Kreinik Mfg. Co., Inc. The Kreinik Seminar is designed to educate the stitcher in the uses of Kreinik metallic and silk threads in varied media, including needlepoint. Lunch provided. Advance registration required by May 15. 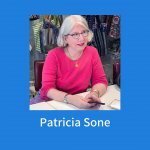 A beading tutorial taught by Patricia Sone in a one day class. 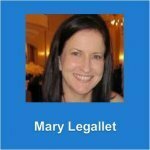 Everything you ever wanted to know about beading! This class will demonstrate beading techniques on 18 mesh. Beading thread, needles, bead mat and other supplies included. Lunch provided. Advance registration required by June 19. A silk ribbon tutorial taught by Patricia Sone in a one day class. This class will be taught as a silk ribbon project on 18 mesh. Different silk ribbon techniques will be demonstrated in addition to some beading and decorative stitches as they relate to the design. Lunch provided. Advance registration required by June 19. If your canvas is not becoming to you then you need to be coming to Julia!!! 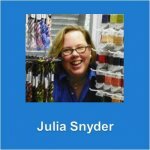 Julia Snyder will be hosting 3 days of embellishment. 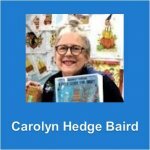 Her embellishment class can be on a new project that Julia will work with you on pulling the threads and the stitches to make your canvas be your work of art. You can also bring couple canvases that you might be stuck on and just need a little help with threads and stitches. The only requirements are that you know how to Basketweave and can follow a chart. Oh and be willing to think outside the box! While this is not a class, we need you to pre-register so we can save you a seat! There is a registration fee to cover drinks, light snacks and incidentals! 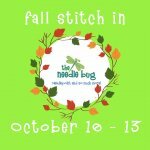 Gather your stitching friends in one spot for 4 days of nothing but stitching, yakking, eating and fun!!! Pick a canvas and have Tony write a stitch guide for it! Canvas Embellishment classes are either two-day, three-day or four-day classes for which the student provides a canvas of choice. Canvases are delivered to Tony at least four months ahead of the class so he has ample time to study, interpret, design, select stitches and threads, and write the guide that will help bring the canvas to life. Each student receives a customized stitch and thread guide for the canvas to accompany individualized instruction during class time. These stitch and thread guides are non-exclusive products, and may be listed in Kazoo's Store for sale to other stitchers. 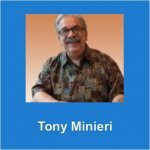 Electronically-purchased guides will not have the benefit of Tony's on-site wisdom, humor or clarification of questions, all of which are a bonus when you participate in a class!